Comforting and loaded with flavor, this one-pot meal has quickly become a new favorite－and it’s loaded with wholesome veggies, too! One of my favorite job-related tasks is the occasional cookbook review. Pouring over the recipes of a soon-to-be-published book evokes a sort of kid-in-the-candy-store feeling. 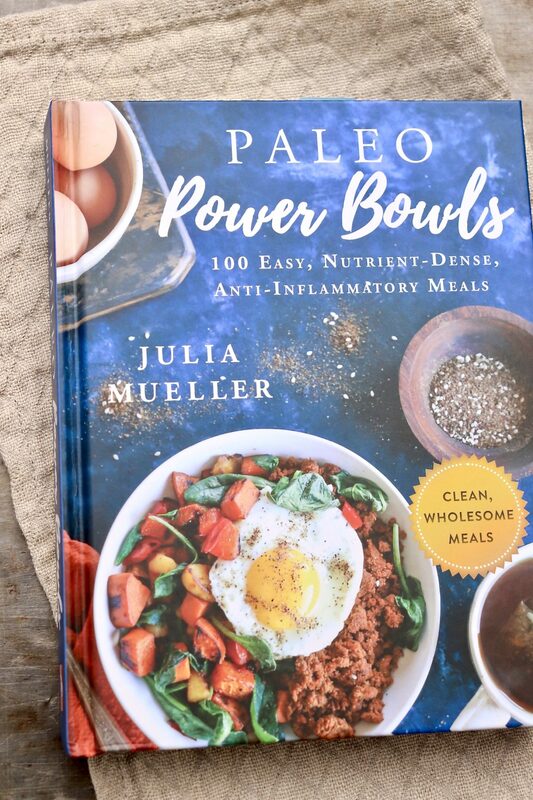 In that spirit, today’s recipe is complements of Paleo Power Bowls, a recently published hardcover by Julia Mueller. 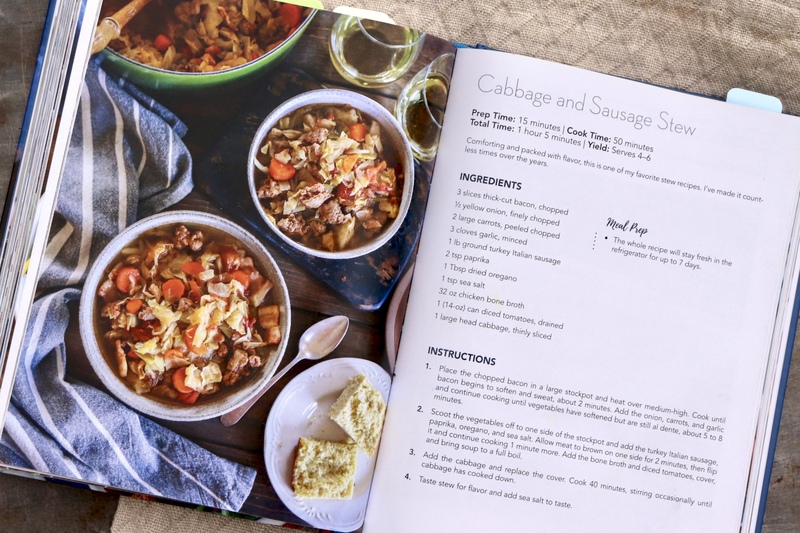 The beautifully photographed pages are filled with a wholesome mix of anti-inflammatory recipes that accommodate a variety of dietary restrictions, from paleo, vegan, gluten-free, keto and low-FODMAP. Labels aside, I originally chose to test the following recipe because it checked a few other metaphorical boxes that so many of us deem important－wholesome, quick and easy. I’ve since returned to this veggie-rich, one-pot meal because my family and I think it’s pretty tasty, too! Julia, the cook and photographer behind The Roasted Root blog, and I became acquainted several years ago through our mutual work in the world of food. After testing some of her recipes early on, I quickly learned that they could be trusted. As someone who takes great pride in a reliable recipe, I wouldn’t introduce you to someone without the same exacting standards! Likewise, Julia’s recipes are wholesome (with a big emphasis on gut health) and often quirky in the best sense of the word. For example, I’ve been a longtime fan of her singular overnight “oats” recipe, which has nary an oat in it －but it’s delicious and stays with me all morning. Paleo Power Bowls reflects Julia’s commitment to wellness, fitness and nutrition and serves as a concrete tool to navigate the concept of clean eating. Importantly, it does so in a balanced, doable and delicious way. In the photo below, you can just see along the top edge of this gorgeous book that I have a half dozen or so pages marked. There is no shortage of recipes that beg to be tried. 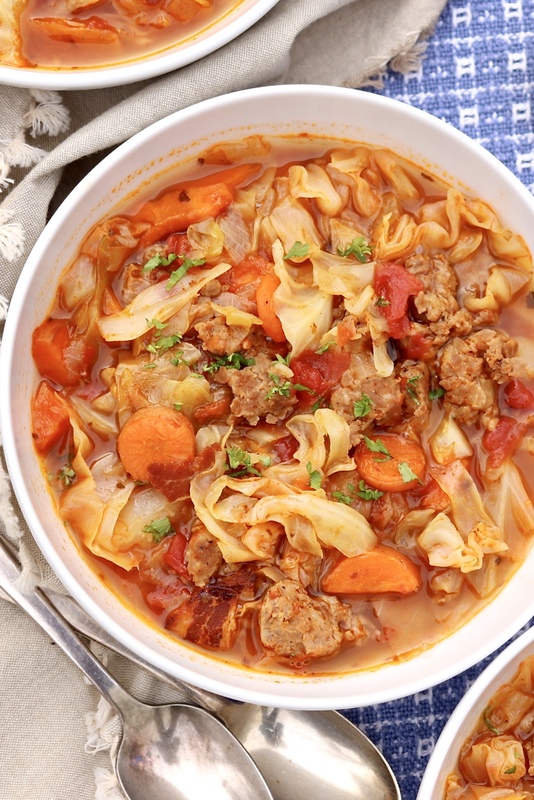 The following recipe for Sausage and Cabbage Stew is one of Julia’s favorites, one that she claims to have made countless times over the years－and I can see why. It’s wholesome, comforting and brimming with flavor. Plus this one-pot meal is truly easy, which removes a potential hurdle. Think of all those recipes that you really enjoy but they’re a little fussy. If you’re like me, this typically leads to a lack of follow through despite the best of intentions. I’ve tweaked Julia’s recipe ever-so-slightly－a little less oregano, included the tomato juices and a few other small details, but absolutely stayed true to the glory of her original recipe. My family will tell you that cornbread (or muffins!) makes a delightful side. 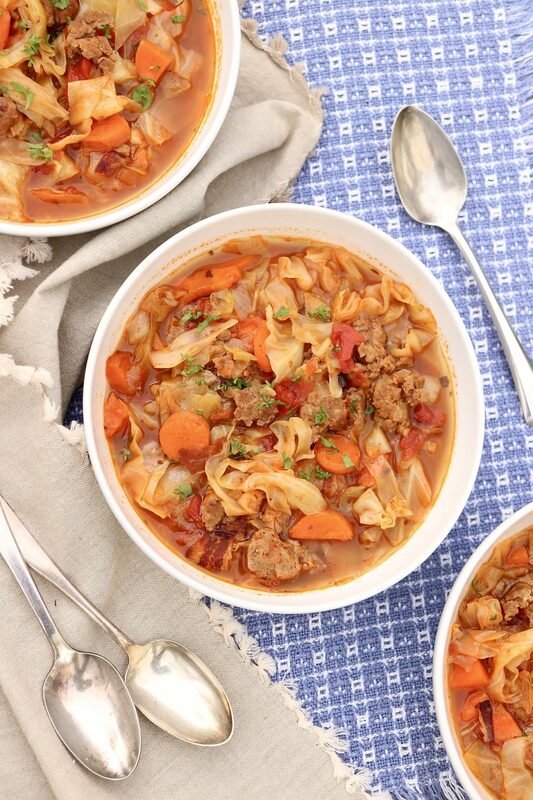 Comforting and loaded with flavor (and lots of veggies), this one-pot meal may become a new favorite! Heat a large pot or Dutch oven over medium-high heat, and add the bacon. Cook until it begins to soften and sweat, about 2 minutes. Add the onion, carrots and garlic, and continue cooking until the vegetables have softened but are still al dente, about 5-8 minutes. Scoot the vegetables off to one side of the pot and add the sausage, paprika, oregano and salt. Allow the meat to brown on one side for 2 minutes, then flip and continue cooking for another minute or so, breaking it up as it continues to cook. Add the bone broth and diced tomatoes with juices. Bring to a full boil, and then add the cabbage. (The pot may seem very full, but the cabbage will wilt and cook down a lot.) Stir to incorporate, and then cover and reduce the heat to maintain a gentle simmer. Cook, stirring occasionally, for 25-30 minutes or until the cabbage is tender. Taste and add a sprinkle of salt and pepper, if needed. Serve with a dusting of optional fresh parsley. 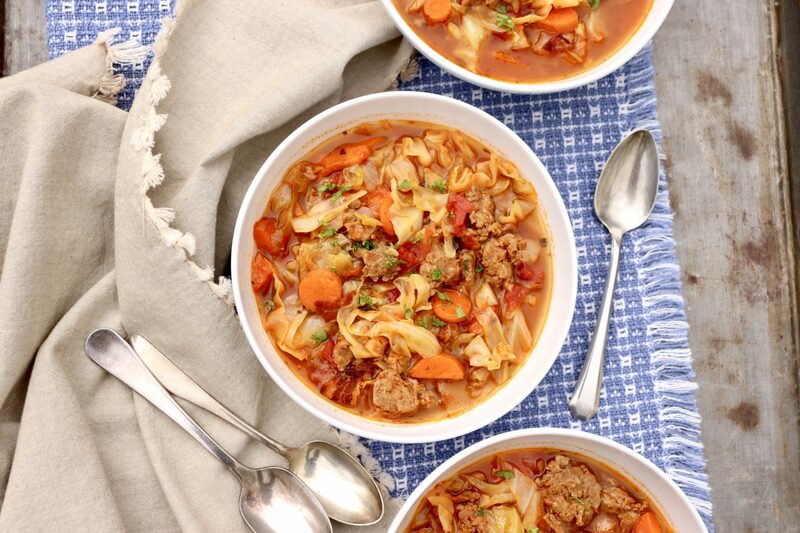 Leftovers may be stored in the refrigerator for up to 7 days – and the flavor improves with age! Plug in your Instant Pot and put it on the ‘Sauté’ mode. Allow it to heat for a couple of minutes. Add the chopped bacon and cook, stirring occasionally, until much of the fat has rendered but the bacon is still tender. Add the onion, carrots, and garlic. Sauté for 2 minutes. Scoot the vegetables off to the side of the Instant Pot and add the ground turkey Italian sausage. Allow the meat to brown for 2 minutes on one side, then flip and allow it to brown another 2 minutes, breaking it up as it cooks. Stir the turkey into the vegetables. Add the remaining ingredients to the Instant Pot in the order in which they appear on the list. Stir well. 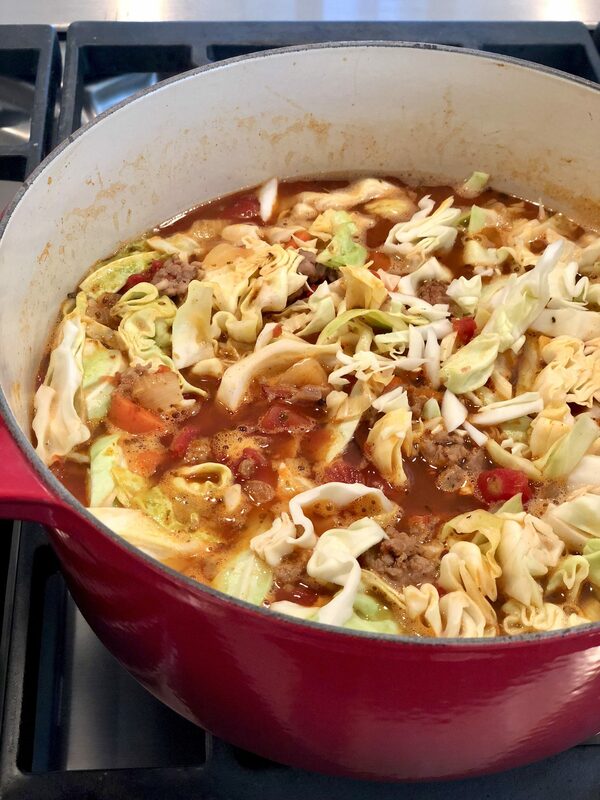 Note that the cabbage will sit on top and will not fully be submerged – this is perfectly fine. Just do your best to stir. Secure the lid on the Instant Pot and place it on the ‘Stew/Meat’ setting. Set the time for 30 minutes. Once the Instant Pot has finished pressure-cooking, allow it to go into the ‘Keep Warm’ mode for 30 minutes. Set the release to venting to release the steam. Stir everything well and serve. *May substitute pork sausage if preferred. Love one pot meals! This looks wonderful and I look forward to making it soon. Me too, Denise, and enjoy! I made this, loved it, very tasty! My husband said it is a keeper! So happy it was a hit, Joan! Made this on Sunday and enjoyed leftovers last night. We really loved this!! I’ll double it next time! Laura, This is a great recipe to double…the leftovers taste so good. I’m delighted it’s a keeper for you, too!